There are four galvanically isolated synchronization inputs. These inputs can be connected directly to the system for voltages up to 24V DC. An external resistor is not necessary. There are two galvanically isolated synchronization outputs. These outputs can be used, for example, to trigger a camera or a slave lighting controller. 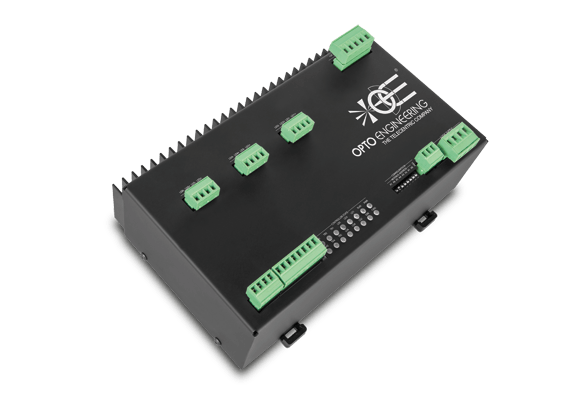 Each of the six channels can be individually configured to output pulses based either on a discrete external trigger signal or an internally-generated trigger. A wide variety of internal triggers can be produced by configuring the internal pulse shaping logic. 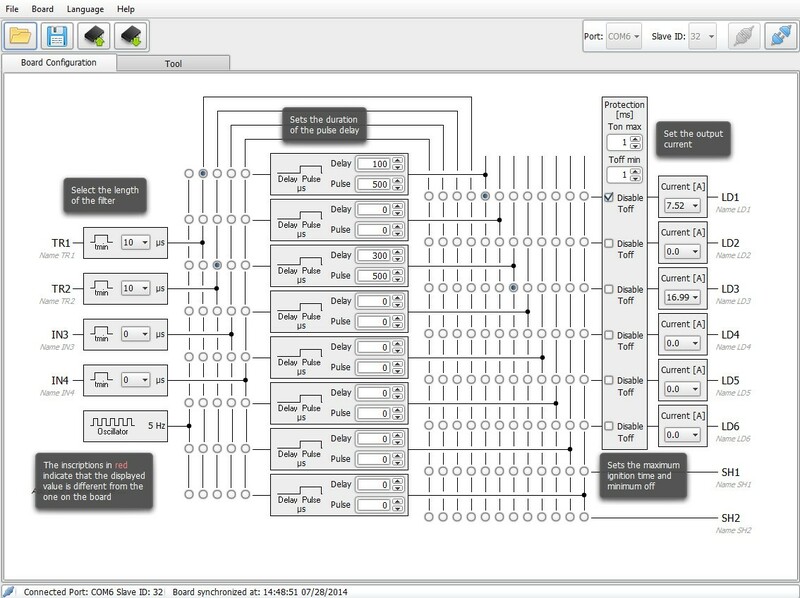 This logic includes eight pulse generators and several multiplexers. The pulse generators allow pulse delay and width control down to 1μsec resolution. The multiplexers, organized as two routing matrices, allow for the flexible selection of the pulse generators inputs and outputs. An output protection circuit, used to prevent the lighting from getting overheated and thus damaged, is also included in this logic. The controller has two independent 24V DC supplies for the power and logic sections. This choice is aimed at increasing versatility. Supply to the logic section must always be present, while supply to the power section can be cut off at any time. Supply to the power section can be removed to protect the end user from photo-biological hazard and other hazardous situations that may happen during fault conditions. These two supplies can be connected together if convenient. The controller has an internal 24V to 48V DC step-up converter. This widens the range of lighting systems the controller can drive. The controller can be quickly configured using an easy-to-use configuration software (which can be downloaded from our web site). The controller implements a subset of the Modbus RTU slave protocol and, as such, can also be configured and managed by any programmable logic controller (PLC) with a proper interface. All the settings are stored in non-volatile memory; the controller will retain these settings even when the supply is removed. The controller is housed in a small, compact unit with DIN rail mounting. For in-depth documentation please refer to the product manual. LTDV6CH can be configured via RS485. You can either download and use our free LTSW software to configure the controller from your PC or directly send low-level commands from a PC using the Modbus/RTU slave protocol (all the Modbus function codes supported by the controller are listed in the manual available online). To use LTSW configuration software your PC must have a native RS485 communication interface or a suitable RS485/USB converter must be used (PN: ADPT001) . In steps of 1 μs. To be ordered separately. ADPT001 consists of - one RS485-USB adapter and - one cable for connection with LTDV6CH. In order to configure LTDV6CH via software a RS485 port must be provided.